On this morning’s whale watch, we once again headed east down the shipping lanes. 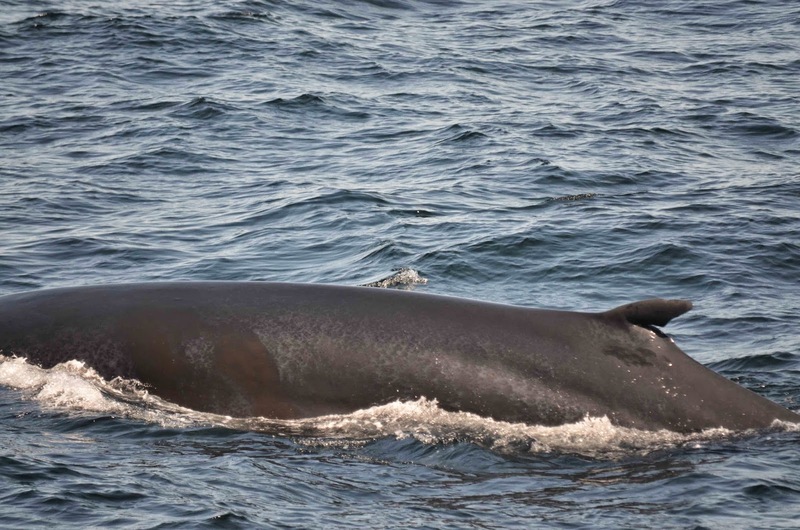 Very soon after passing Boston lighthouse which marks the end of Boston Harbor, we spotted two of the fin whales we spent time with yesterday. 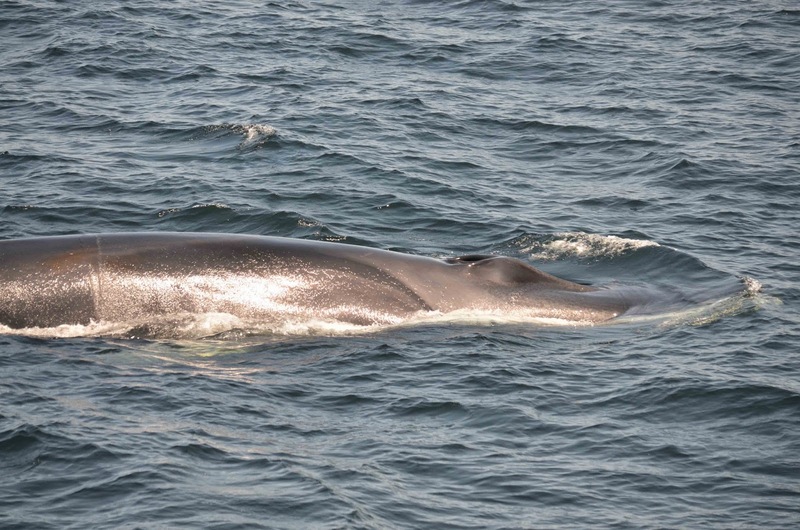 Fjord and the other familiar fin whale had traveled some distance west of where they were yesterday. We had absolutely fantastic looks of Fjord’s beautiful markings as he logged right next to the boat. The other whale was nearby traveling slowly. I could tell it was one of the same whales from yesterday not by the shape of the dorsal fin—though that does help—but rather by a signature move that it often displays. 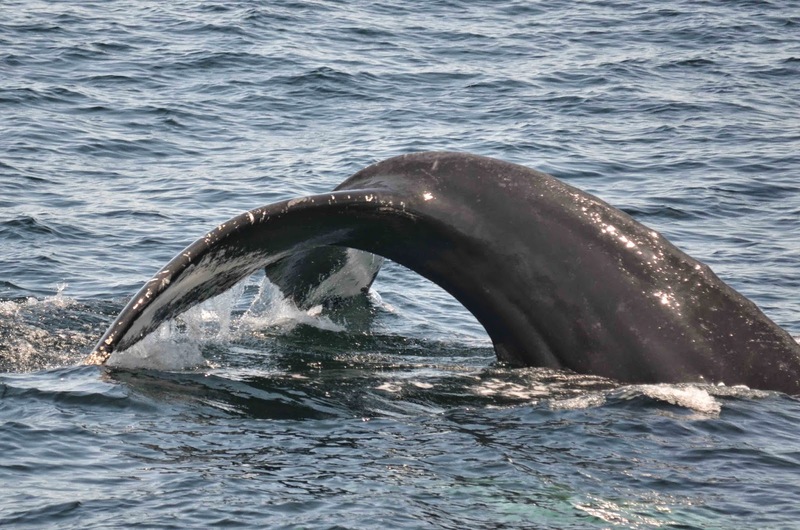 This particular whale has a habit of repeatedly lifting its tail stock up out of the water just far enough that you can see its peduncle without its fluke. The peduncle is towards the end of the tail at the very base of the fluke. While fin whales don’t typically fluke, this sort of movement is typically an indication that the whale is going to dive. We call this a sounding dive as opposed to a fluking dive. However, this whale will exhibit this behavior repeatedly without diving. It’s possible that this display is associated with a feeding strategy similar to kick feeding, though I haven’t seen or heard of this technique exhibited by other fin whales. By the end of our trips yesterday, I jokingly started calling this whale Peduncle because of these unique movements that helped me distinguish this individual from the others. Nearby, we spotted a humpback and we had just enough time to go over and see who it was. We ended up getting some great looks at this individual who turned out to be quite difficult to ID. It was making relatively quick dives but these were mostly sounding dives which made it difficult to get a good look at its fluke. 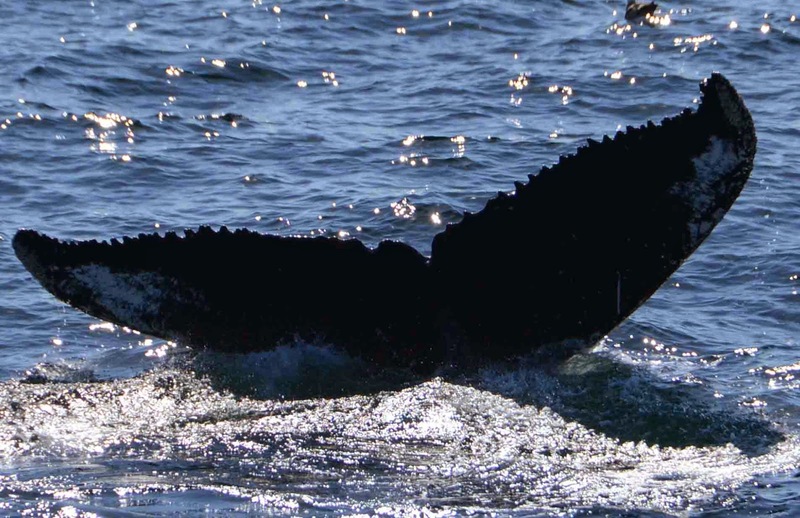 Luckily on its farewell dive, I captured a photo of the ventral fluke even though the whale was heading towards us. After much difficulty, our NEAq interns Rich and Lindsey helped me ID the whale as Springboard, a humpback who was first seen back in 1997. On our second trip, we again passed our “Peduncle” fin whale but also got to see a large pod of Atlantic white-sided dolphins. Many of these dolphins were breeching and traveling very close to the boat. They followed us for about 10 minutes and we even spotted a mother and calf pair, a special treat for our mothers on board for Mother’s Day! We knew we were in for another treat when we spotted an enormous congregation of birds in the distance. 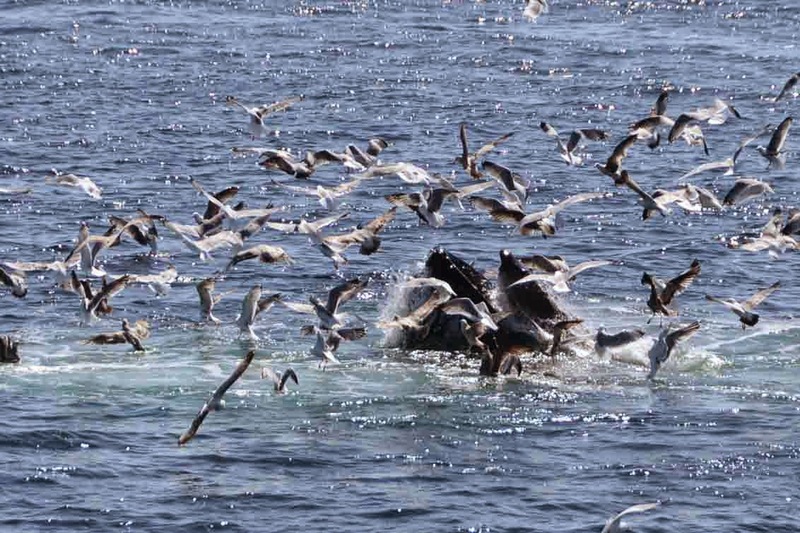 The rule of thumb out at Stellwagen Bank is that where there are birds, there are whales. Low and behold, beneath hundreds of birds, Springboard and another humpback whale named Amulet were open mouth feeding and kick feeding. These two put on an incredible show for us for about 45 minutes as they corralled small fish beneath the ocean’s surface and repeatedly lunged up out of the water to devour their prize. It was such an incredible and exciting trip! Unfortunately, I had a bit of a mishap with my memory card and none of the photos I took were saved but, luckily a professional photographer on board was kind enough to let me use some of her photos for identification purposes and for our whale log! I’d like to give a very special thank you to Molly and her son Evan! Without Molly, I would not have had the photo to ID our second humpback and, without Evan, I don’t think I would have been able to find Amulet in our large humpback catalog! Thank you so much to Molly and Evan and Happy Mother’s Day to everyone! 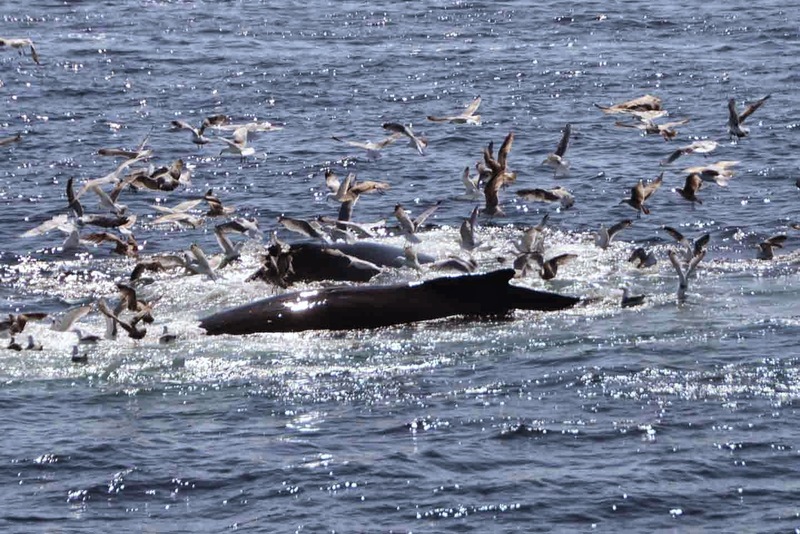 All photos of feeding whales are courtesy of Molly McEachern Smith.